Bus from KL to Sungai Petani is still the preferred choice of passengers even after launching of KTM ETS train service. That is because bus supplies many departures throughout the day, starting from morning 0730 until midnight 1200. Transnasional are the key player in the market serving the bus from KL to Sungai Petani. They supply frequent bus schedule to Sungai Petani from KL especially evening period. Other players like Mayang Sari, Etika, Konsortium, Kejora Express and Eagle Express also provide bus service from KL to Sungai Petani but with lesser schedule. 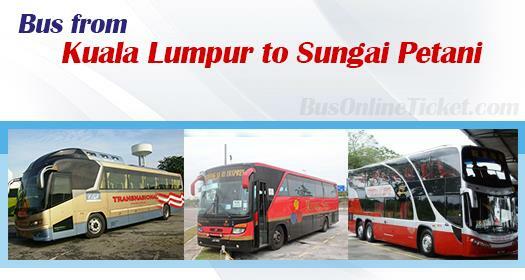 Duration for bus from KL to Sungai Petani takes about 5-6 hours depending on traffic condition. Coaches depart from TBS (Terminal Bersepadu Selatan) and terminate at Sungai Petani Bus Terminal situated at Jalan Kuala Ketil in Sungai Petani. Bus from KL to Sungai Petani has 1 stopover along the highway for toilet break. Toilet break is provided because all coaches in Malaysia has no toilet in the bus. The bus fare for from KL to Sungai Petani is ranging from RM 38.40 to RM 40.00 depending on your coach brand. Normally coaches are those spacious 3-seat-a-row VIP bus, so that passengers could have a comfortable journey to Sungai Petani. Taking bus from KL to Sungai Petani is easy with the number of available daily schedules. Now it is even more convenient by booking your bus ticket online at BusOnlineTicket.com with instant confirmation. Passengers could save their time to go bus station in advance purposely just to buy ticket over the counter.